From a behavioural point of view cats are fascinating creatures and people often have trouble interpreting their quirky and unique behavioural patterns . There are a few things we misunderstand about them and we tend to judge their behaviours and psyche in human terms. Basically the cat’s psyche goes like this: cats are just too clever to live in groups. They’re smart. They are fast, beautifully coordinated and blessed with brilliant senses of sight, hearing and touch. And with the claws and teeth that they come with, they don’t need any help hunting– they can do it all by themselves. There is no survival advantage in joining in cohorts to hunt their prey and the very real disadvantage of having to share any catch if they did. The hunting instinct is strong, starting out as disguised practice by kittens obsessed with play. This develops quickly until eventually we all get to know the joy of the disembowelled rat on the lounge carpet. The cat sits proudly beside it. He didn’t need any other cat to help him catch it. He did it all by himself. As a result of all of this, cats have not developed pecking orders, complex language or social protocols. They don’t need all that. It is not a survival advantage to live as a group. They can do everything by themselves. Hence they don’t have much in the way of facial language or social graces when it comes to dealing with each other. Cats living in colonies don’t have a very complicated social structure and nor does the lion which lives in a harem. Here there is one male to protect his cubs and his lionesses from other juvenile males who are seeking to take the harem for themselves and kill any cubs or disagreeable lionesses in the process. Male cubs are usually banished from the pride after one year of age to roam the plains as individuals until they can challenge adult male lions or set up prides of their own. So within the pride there is a survival advantage in living together to provide for the cubs and the safety of group as a whole. Lionesses share their milk across litters and share in the general care and well-being of the nursery. Social contact in these groups does lead to hierarchies and behavioural displays and some of these are seen in the domestic cat. 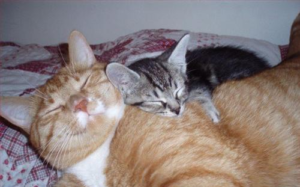 Domestic cats can play together if they are young and especially if they are litter mates just as lion cubs do; and one often sees adult behaviours such as head-butting when they greet one another and mutual grooming. All other wild cats however live as individuals because they have found it better suits them to survive this way. They come together for mating only and these are often fairly antagonistic encounters. Other than that, they concentrate on forming territories and protecting the resources within that territory from other rivals. The domestic cat therefore comes with a mixed set of values based mostly on what these other cats do-i.e. living alone establishing territories -combined with the social graces one sees within lion prides. Dogs on the other hand, aren’t as clever as cats physically and have to live in packs in order to survive. They have developed pecking orders, body language and complex social structures in the wild that enable them to survive and hunt as a pack for the overall good of the group. This seems to apply to most dog groups in the wild. These behaviour patterns exist in domestic dogs as well and allow dogs to be read like a book. So as individuals, cats are compelled instead to devote their life to developing territories and then spend their time protecting the resources within these territories from other cats. Their behaviour patterns are then built around these activities. They don’t see each other as potential companions (as dogs do) –only as potential rivals and invaders of their territory. So the basic psyche of the cat comes down to territory, territory, territory. 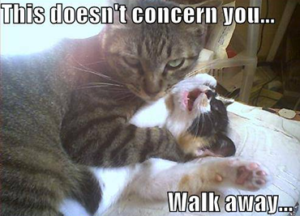 This explains cat politics and why they fight all the time. Fighting is just what cats do. It also explains why they pee inside, why they go back to old territories when their owners shift, and why they often don’t get on with new cats introduced into the family. Toileting inside is a common complaint that drives owners up the wall so let’s talk about it more. People often wonder why cats exhibit naughty behaviours such as toileting or urinating inside. Owners tend to blame this on anything from disobedience to plain laziness on the cat’s behalf. These behaviours are actually tell-tale signs of “ Feline Stress ’’. This is often a surprise diagnosis for owners because all their cat seems to do is eat, then sleep, eat again then lazily relocate back to the sun to sleep; how stressful could that be?? The problem is, cats don’t display their anxiety in a histrionic Hollywood manner as dogs often would. It is not surprising that we are unaware of their subtle antagonistic glances or subtle body postures when they are in the company of another family cat. It is of course quite obvious and aggressive when they are in the presence of another feline intruder. Because domestic cats aren’t social animals they don’t take kindly to sharing anything with neighbouring cats. They sometimes struggle with this concept when there is another cat within the family and this subtle antagonism often worsens with age. Throw in a neighbourhood cat at the same time and some cats can get very stressed as they feel their territory becoming crowded. Remember, cats are compelled to devote their life to developing and protecting territories. They tend to see each other as potential rivals or invaders, they simply aren’t out to make friends because evolutionary-speaking there was no survival advantage in them doing this. So when living in a multi-cat house they are constantly under pressure to go against their natural instinct: they are forced to share. The same applies if it happens to be the cat next door always coming across. The threat of loss of territory is stressful, a cat becomes nervous and insecure if constantly challenged by other cats for a slice of their pie. Loss of a territory is absolutely catastrophic, causing a disastrous loss of prestige and self-esteem. Since cats will only toilet in their own territory; if they lose confidence in the security of their territory, then they are driven to toilet inside as a last resort. Some are terrorised and are too scared to go back outside for long periods. Some will also spray inside to try and boost their confidence and proclaim the little existing territory that they have left. They feel terrorised and oppressed when they perceive that their territory has been usurped and seek to reinforce the home’s inner sanctum as their own – by territory marking. Some cats of course are able to deal with this stress much better than others and therefore don’t urinate inside. But for those that struggle, urinating inside is common practice. Because cat encounters often happen at night, cat owners frequently miss this conflict and fail to recognise it as the cause of the inappropriate toileting inside and become frustrated by the cat’s “laziness”. The solution for this scenario is never straight forward but involves medications ranging from anxiolytic [anxiety-breaking] drugs to hormones [called pheromones] released into the air from diffusers. It is also important to prevent other cats from entering the home so that every cat knows its inner sanctum is secure and sacrosanct. It is usually necessary to combine several of these approaches to calm the cat back to normal behaviour. In some instances the family dog is the saviour -its presence is enough to discourage other cats coming onto the property and the family cat lives a very secure, unchallenged existence. So in summary a cat’s behaviour is driven by its evolutionary past that has dictated it to be an independent survivor with reduced social expressions compared to dogs. Over the centuries however, it has learnt that a social bonding with humans is very advantageous and the cat possesses the affectionate social skills that one would find in a lion pride that enables it to bond lovingly with us.